The second edition of the College Football Playoff rankings were released last night, and fans of the Big Ten conference have reason to celebrate but at the same time quiver with fear. The Michigan Wolverines moved up a spot from the No. 5 position to the No. 4 spot, which means if the playoffs started this weekend, the Big Ten would be included in the CFP once again. However, with that No. 4 position comes the daunting task of playing Alabama, and that is almost considered a guaranteed loss based on how rock-solid the Crimson Tide look. Of course, in football, anything can happen, and any team can win on any given Saturday, but the Wolverines simply don't have the offense required to keep up with the Crimson Tide should they match up against each other on Dec. 29. Hypothetically speaking, if this indeed was the matchup, the Wolverines would have to rely on their defense to contain one of the most efficient offenses in college football. The Wolverines still have a long way to go before prepping for Alabama, as they still need to win out in order to secure a CFP birth. That means beating Ohio State on the road and very likely winning the Big Ten title against either Northwestern or Wisconsin. The Big Ten conference remained in the College Football Playoff discussion thanks in large part to Michigan's convincing win over Penn State. 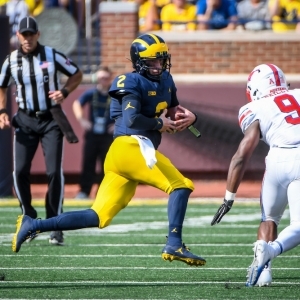 The Wolverines beat the Nittany Lions 42-7 and dominated every facet of the game, which should bump them into the Top 4 teams in the country. The Wolverines still have it all to play for, however, as they must travel to Rutgers and Ohio State, with a home date against Indiana sandwiched in between. Anything short of winning out would crush their chances of a CFP spot. The aforementioned Buckeyes narrowly squeaked by a resurgent Nebraska by a score of 36-31. The Buckeyes have now failed to cover the spread in four straight games. Elsewhere in the Big Ten, Wisconsin got by Rutgers 31-17, Michigan State easily beat Maryland 24-3, Illinois upset Minnesota 55-31, Purdue beat ranked Iowa 38-36 and Notre Dame got the better of Northwestern to keep their playoff hopes alive. There are seven games in the Big Ten conference this week, with about half of them being relevant to the standings and team's playoff hopes. The biggest game of the week goes in East Lansing, where No. 10 Ohio State travels to Michigan State to take on the Spartans. As of writing this, the Buckeyes are 3.5-point favorites with the total set at 50. The rest of the Big Ten card looks like this; Maryland at Indiana (-3.5), Wisconsin at No. 14 Penn State (-8), Illinois at Nebraska (-17.5), No. 5 Michigan (-39) at Rutgers, Northwestern at Iowa (-10) and Purdue (-12.5) at Minnesota. Biggest Mismatches to Exploit in Week 11. The Minnesota Golden Gophers got off to a great start to the season. They went 3-0 and outscored their opponents 95-27. And then conference play started. The Gophers proceeded to lose four straight and failed to hold their opponent to fewer than 30 points. In fact, in each of the last six games, they've failed to hold their opponents under that 30-point mark. However, If Minnesota can exploit one thing this weekend on Purdue to find themselves back in the win column, it will be through their passing attack. The Gophers have been forced to start their backup quarterback, Tanner Morgan, for the last few weeks after Zack Annexstad went down with an injury. Morgan has given life to the passing game with more downfield throws and just an overall confidence about his play. If and likely when this game starts, Minnesota will likely need to trade scores with Purdue's high-powered offense, and Morgan is the guy to make that happen. Purdue's secondary ranks last in the conference in passing yards allowed per game, so if you have the strength to stomach backing a team with a defense as poor as Minnesota's, then grabbing the 12.5 points with the Gophers is likely the play in what figures to be a high-scoring affair. Make no mistake about it, Michigan is going to annihilate Rutgers in this game. They are better in every facet of the game, and Rutgers is just comically bad. However, Michigan will be doing a lot of ground and pound and will have success with it despite Rutgers knowing what's coming. Michigan ranks 24th overall in the nation in rushing yards per game at 217.9. They should be able to get to where they want to go on the ground against the Rutgers defense that ranks 116th out of 130 teams in stopping the run, giving up 233.8 yards per game. As of writing this, Michigan is laying 39 points on the road with the total set at 48.5. Not sure I've ever seen a point spread that high, with a total that low. When you look at how the game will play out, Michigan should be able to run the ball with relative ease and keep the clock running all game. The Wolverines would like nothing more than to get out of Rutgers unscathed and without breaking a sweat. I know Michigan will kill Rutgers, but is it really necessary to win by 40 points? It could be worth a look taking Rutgers +39 and hope the run game of Michigan just keeps the clock rolling.